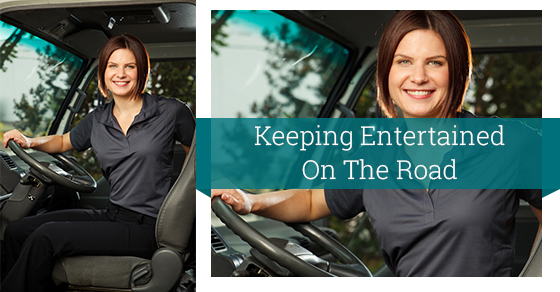 Driving a truck can be a great career for men and women of all ages. It can offer great job security and pay as well as the ability to work independently and travel. The nature of the job also means that drivers spend a lot of time alone, with only themselves and their environment for entertainment. Luckily, there are many things truck drivers can do to stay alert and help alleviate boredom to pass the time. Discover awesome apps. Truck drivers in 2016 have something that drivers of generations past wish they had: Smart phones and tablets. Apps like Skype and Whatsapp allow you to stay connected to friends and family and apps like Pandora or Spotify let you bring your entire music collection with you. Download Netflix and you have a portable home theatre during meal stops, and Voice Text Pro allows you to send text messages and drive safely. Develop a portable hobby. There has been a strong increase in the amount of new hobbies that haven’t traditionally been associated with truck driving. Things like sewing, knitting and crocheting, as well as novel and journal writing with voice-to-text software, creating visual stories of their trips with their smartphone cameras, or even video and computer games can help entertain you while you’re on the road. Start a collection. The fact that many truck drivers get to travel and see the entire country where they are working means that the opportunity to collect different, and perhaps even related, things from all over the nation presents itself. Postcards, stamps, even jars of soil from each new destination are a great way of telling a story to people back home or even just to satisfy the human urge to collect. We are hunters and gatherers, after all. Stay fit. A sedentary lifestyle, which truck driving by definition most certainly is, can take a toll on your health. The National Institute of Health in the United States reports that more than half of truck drivers tend to be obese. You can help to not only combat this but can also entertain yourself while doing so by utilizing down time to take a hike, walk a trail, or use a local gym. Be reflective. Many people avoid the act of self-reflection because it forces them to consider things about their lives and themselves they may find unpleasant. Confronting these types of realizations is actually healthy and can give you not only perspective that you may otherwise not have gained without the solitude of the road, but it can be immensely satisfying to know that you are becoming more self-aware. Boredom, regardless of the number of options you have to quell it, can set in for anyone and the psychological effects can be quite uncomfortable. Fortunately for the drivers of the new millennium, the number of options you have for healthy mental and physical stimulation are pretty much endless. Incorporate some or all of the above into your next road trip and you won’t even know you’re gone.